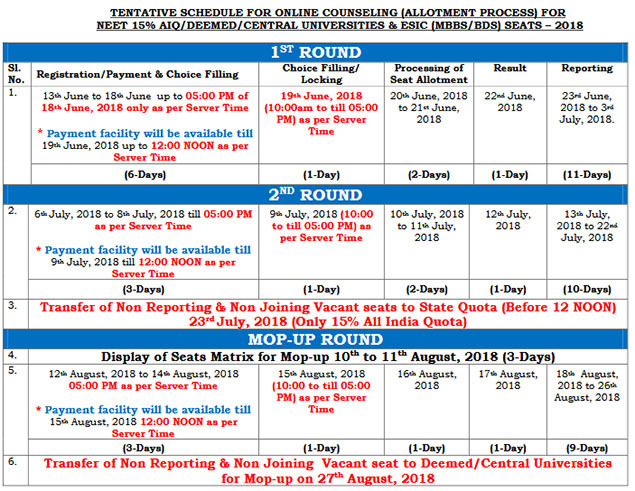 NEET UG Counselling 2018 Round 2: The Medical Counseling Committee (MCC) under Directorate General of Health Services, Ministry of Health & Family Welfare, Government of India is set to start online counselling for Round 2 from July 06, 2018. Candidates who have passed NEET 2018 and are now willing to participate in NEET UG Counselling 2018 Round 2 shuld register, make payment and fill their choices and options from July 06, 2018 onwards. The last date of Round 2 Registration and Choice Filling is July 08, 2018 up to 05:00 pm. Click here to go to official website: www.mcc.nic.in. Click on “New Registration” under Online Services section of the home page. Click on “Candidate Login” if you have already registered. Candidates should note that the last date to make payment for NEET UG Round 2 Counselling is July 09, 2018 till 12:00 noon. Choice Filling and Locking of options for Round 2 should be done on July 09 from morning 10:00 to 05:00 pm. Processing of Seat Allotment will be done from July 10 to July 11, 2018 and Round 2 Seat Allotment Result will be declared on July 12, 2018. Reporting to the allotted colleges for Round 2 will start on July 13 and candidates should report to their allotted college on or before July 22, 2018. “For State quota and other seats falling under the ambit of States, candidates may apply to their domicile states and a merit list as per State rules and based on All India Rank will be prepared by concerned counselling authorities”, CBSE said. “Candidates are advised to be in touch with the respective Counselling Authorities and Institutions concerned for further details”, it added.